Deutschland Tour – it starts! de Bastion’s on the road! We’re on the road! 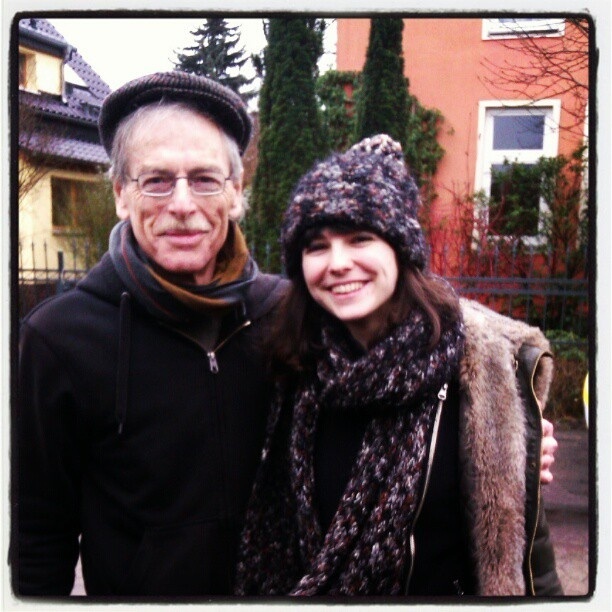 For the very first leg of the tour I’m joined by none other than Mr. de Bastion (Dad!). Yesterday we drove from Berlin to Hamburg, which made for an excellent change from the usual rails. Entertainment was provided by Foo Fighters and Tame Impala, interspersed with quiz-like questions only a Dad could ask, such as: “What do you know about Cumulo-Nimbus?” (Followed by: “Huh?”). The dramatic cloud formations ahead indicated stormy weather, so I was told and, incidentally, whilst I’m writing this in the little cafe in Hamburg, it just started poring down torrential rain after having snowed in the night. We arrived just in time for Richard’s soundcheck. He played a show at the “Music Club Live”, which coincidently just shared an award for best newcomer support with “Freundlich und Kompetent”, where I’m playing tonight. In a couple of hours I’m playing some live songs on Tide Radio here in Hamburg – it’s going to be my first interview in German, so slightly scared of that! At the moment this feels like a holiday, spending time with my Dad and preparing for gigs. Really looking forward to the first show of the tour and the following week – jetzt geht’s los!! Previous PostPrevious Red and White Blood Cells on RADIO EINS! Next PostNext Tales from the German Rails!